Dynamic: This term means that testing always implies executing the program on selected inputs. To be precise, the input value alone is not always sufficient to specify a test, since a complex, nondeterministic system might react to the same input with different behaviors, depending on the system state. In this KA, however, the term “input” will be maintained, with the implied convention that its meaning also includes a specified input state in those cases for which it is important. Static techniques are different from and complementary to dynamic testing. Static techniques are covered in the Software Quality KA. It is worth noting that terminology is not uniform among different communities and some use the term “testing” also in reference to static techniques. Finite: Even in simple programs, so many test cases are theoretically possible that exhaustive testing could require months or years to execute. This is why, in practice, a complete set of tests can generally be considered infinite, and testing is conducted on a subset of all possible tests, which is determined by risk and prioritization criteria. Testing always implies a tradeoff between limited resources and schedules on the one hand and inherently unlimited test requirements on the other. Selected: The many proposed test techniques differ essentially in how the test set is selected, and software engineers must be aware that different selection criteria may yield vastly different degrees of effectiveness. How to identify the most suitable selection criterion under given conditions is a complex problem; in practice, risk analysis techniques and software engineering expertise are applied. Expected: It must be possible, although not always easy, to decide whether the observed outcomes of program testing are acceptable or not; otherwise, the testing effort is useless. The observed behavior may be checked against user needs (commonly referred to as testing for validation), against a specification (testing for verification), or, perhaps, against the anticipated behavior from implicit requirements or expectations (see Acceptance Tests in the Software Requirements KA). In recent years, the view of software testing has matured into a constructive one. Testing is no longer seen as an activity that starts only after the coding phase is complete with the limited purpose of detecting failures. Software testing is, or should be, pervasive throughout the entire development and maintenance life cycle. Indeed, planning for software testing should start with the early stages of the software requirements process, and test plans and procedures should be systematically and continuously developed—and possibly refined—as software development proceeds. These test planning and test designing activities provide useful input for software designers and help to highlight potential weaknesses, such as design oversights/contradictions, or omissions/ambiguities in the documentation. For many organizations, the approach to software quality is one of prevention: it is obviously much better to prevent problems than to correct them. Testing can be seen, then, as a means for providing information about the functionality and quality attributes of the software and also for identifying faults in those cases where error prevention has not been effective. It is perhaps obvious but worth recognizing that software can still contain faults, even after completion of an extensive testing activity. Software failures experienced after delivery are addressed by corrective maintenance. Software maintenance topics are covered in the Software Maintenance KA. In the Software Quality KA (see Software Quality Management Techniques), software quality management techniques are notably categorized into static techniques (no code execution) and dynamic techniques (code execution). Both categories are useful. This KA focuses on dynamic techniques. Software testing is also related to software construction (see Construction Testing in the Software Construction KA). In particular, unit and integration testing are intimately related to software construction, if not part of it. The breakdown of topics for the Software Testing KA is shown in Figure 4.1. A more detailed breakdown is provided in the Matrix of Topics vs. Reference Material at the end of this KA. The first topic describes Software Testing Fundamentals. It covers the basic definitions in the field of software testing, the basic terminology and key issues, and software testing’s relationship with other activities. The second topic, Test Levels, consists of two (orthogonal) subtopics: the first subtopic lists the levels in which the testing of large software is traditionally subdivided, and the second subtopic considers testing for specific conditions or properties and is referred to as Objectives of Testing. Not all types of testing apply to every software product, nor has every possible type been listed. The test target and test objective together determine how the test set is identified, both with regard to its consistency—how much testing is enough for achieving the stated objective—and to its composition—which test cases should be selected for achieving the stated objective (although usually “for achieving the stated objective” remains implicit and only the first part of the two italicized questions above is posed). Criteria for addressing the first question are referred to as test adequacy criteria, while those addressing the second question are the test selection criteria. Several Test Techniques have been developed in the past few decades, and new ones are still being proposed. Generally accepted techniques are covered in the third topic. Test-Related Measures are dealt with in the fourth topic, while the issues relative to Test Process are covered in the fifth. Finally, Software Testing Tools are presented in topic six. Definitions of testing and testing-related terminology are provided in the cited references and summarized as follows. Many terms are used in the software engineering literature to describe a malfunction: notably fault, failure, and error, among others. This terminology is precisely defined in [3, c2]. It is essential to clearly distinguish between the cause of a malfunction (for which the term fault will be used here) and an undesired effect observed in the system’s delivered service (which will be called a failure). Indeed there may well be faults in the software that never manifest themselves as failures (see Theoretical and Practical Limitations of Testing in section 1.2, Key Issues). Thus testing can reveal failures, but it is the faults that can and must be removed . The more generic term defect can be used to refer to either a fault or a failure, when the distinction is not important . However, it should be recognized that the cause of a failure cannot always be unequivocally identified. No theoretical criteria exist to definitively determine, in general, the fault that caused an observed failure. It might be said that it was the fault that had to be modified to remove the failure, but other modifications might have worked just as well. To avoid ambiguity, one could refer to failure-causing inputs instead of faults—that is, those sets of inputs that cause a failure to appear. A test selection criterion is a means of selecting test cases or determining that a set of test cases is sufficient for a specified purpose. Test adequacy criteria can be used to decide when sufficient testing will be, or has been accomplished  (see Termination in section 5.1, Practical Considerations). Testing effectiveness is determined by analyzing a set of program executions. Selection of tests to be executed can be guided by different objectives: it is only in light of the objective pursued that the effectiveness of the test set can be evaluated. In testing for defect discovery, a successful test is one that causes the system to fail. This is quite different from testing to demonstrate that the software meets its specifications or other desired properties, in which case testing is successful if no failures are observed under realistic test cases and test environments. An oracle is any human or mechanical agent that decides whether a program behaved correctly in a given test and accordingly results in a verdict of “pass” or “fail.” There exist many different kinds of oracles; for example, unambiguous requirements specifications, behavioral models, and code annotations. Automation of mechanized oracles can be difficult and expensive. Testing theory warns against ascribing an unjustified level of confidence to a series of successful tests. Unfortunately, most established results of testing theory are negative ones, in that they state what testing can never achieve as opposed to what is actually achieved. The most famous quotation in this regard is the Dijkstra aphorism that “program testing can be used to show the presence of bugs, but never to show their absence” . The obvious reason for this is that complete testing is not feasible in realistic software. Because of this, testing must be driven based on risk [6, part 1] and can be seen as a risk management strategy. Infeasible paths are control flow paths that cannot be exercised by any input data. They are a significant problem in path-based testing, particularly in automated derivation of test inputs to exercise control flow paths. The term “software testability” has two related but different meanings: on the one hand, it refers to the ease with which a given test coverage criterion can be satisfied; on the other hand, it is defined as the likelihood, possibly measured statistically, that a set of test cases will expose a failure if the software is faulty. Both meanings are important. Software testing is related to, but different from, static software quality management techniques, proofs of correctness, debugging, and program construction. However, it is informative to consider testing from the point of view of software quality analysts and of certifiers. Testing vs. Static Software Quality Management Techniques (see Software Quality Management Techniques in the Software Quality KA [1*, c12]). Testing vs. Correctness Proofs and Formal Verification (see the Software Engineering Models and Methods KA [1*, c17s2]). Testing vs. Debugging (see Construction Testing in the Software Construction KA and Debugging Tools and Techniques in the Computing Foundations KA [1*, c3s6]). Testing vs. Program Construction (see Construction Testing in the Software Construction KA [1*, c3s2]). Software testing is usually performed at different levels throughout the development and maintenance processes. Levels can be distinguished based on the object of testing, which is called the target, or on the purpose, which is called the objective (of the test level). The target of the test can vary: a single module, a group of such modules (related by purpose, use, behavior, or structure), or an entire system. Three test stages can be distinguished: unit, integration, and system. These three test stages do not imply any process model, nor is any one of them assumed to be more important than the other two. Unit testing verifies the functioning in isolation of software elements that are separately testable. Depending on the context, these could be the individual subprograms or a larger component made of highly cohesive units. Typically, unit testing occurs with access to the code being tested and with the support of debugging tools. The programmers who wrote the code typically, but not always, conduct unit testing. Integration testing is the process of verifying the interactions among software components. Classical integration testing strategies, such as topdown and bottom-up, are often used with hierarchically structured software. Modern, systematic integration strategies are typically architecture-driven, which involves incrementally integrating the software components or subsystems based on identified functional threads. Integration testing is often an ongoing activity at each stage of development during which software engineers abstract away lower-level perspectives and concentrate on the perspectives of the level at which they are integrating. For other than small, simple software, incremental integration testing strategies are usually preferred to putting all of the components together at once—which is often called “big bang” testing. System testing is concerned with testing the behavior of an entire system. Effective unit and integration testing will have identified many of the software defects. System testing is usually considered appropriate for assessing the nonfunctional system requirements—such as security, speed, accuracy, and reliability (see Functional and Non-Functional Requirements in the Software Requirements KA and Software Quality Requirements in the Software Quality KA). External interfaces to other applications, utilities, hardware devices, or the operating environments are also usually evaluated at this level. Testing is conducted in view of specific objectives, which are stated more or less explicitly and with varying degrees of precision. Stating the objectives of testing in precise, quantitative terms supports measurement and control of the test process. Testing can be aimed at verifying different properties. Test cases can be designed to check that the functional specifications are correctly implemented, which is variously referred to in the literature as conformance testing, correctness testing, or functional testing. However, several other nonfunctional properties may be tested as well— including performance, reliability, and usability, among many others (see Models and Quality Characteristics in the Software Quality KA). Other important objectives for testing include but are not limited to reliability measurement, identification of security vulnerabilities, usability evaluation, and software acceptance, for which different approaches would be taken. Note that, in general, the test objectives vary with the test target; different purposes are addressed at different levels of testing. The subtopics listed below are those most often cited in the literature. Note that some kinds of testing are more appropriate for custom-made software packages—installation testing, for example—and others for consumer products, like beta testing. Acceptance / qualification testing determines whether a system satisfies its acceptance criteria, usually by checking desired system behaviors against the customer’s requirements. The customer or a customer’s representative thus specifies or directly undertakes activities to check that their requirements have been met, or in the case of a consumer product, that the organization has satisfied the stated requirements for the target market. This testing activity may or may not involve the developers of the system. Often, after completion of system and acceptance testing, the software is verified upon installation in the target environment. Installation testing can be viewed as system testing conducted in the operational environment of hardware configurations and other operational constraints. Installation procedures may also be verified. Before software is released, it is sometimes given to a small, selected group of potential users for trial use (alpha testing) and/or to a larger set of representative users (beta testing). These users report problems with the product. Alpha and beta testing are often uncontrolled and are not always referred to in a test plan. Testing improves reliability by identifying and correcting faults. In addition, statistical measures of reliability can be derived by randomly generating test cases according to the operational profile of the software (see Operational Profile in section 3.5, Usage-Based Techniques). The latter approach is called operational testing. Using reliability growth models, both objectives can be pursued together  (see Life Test, Reliability Evaluation in section 4.1, Evaluation of the Program under Test). According to , regression testing is the “selective retesting of a system or component to verify that modifications have not caused unintended effects and that the system or component still complies with its specified requirements.” In practice, the approach is to show that software still passes previously passed tests in a test suite (in fact, it is also sometimes referred to as nonregression testing). For incremental development, the purpose of regression testing is to show that software behavior is unchanged by incremental changes to the software, except insofar as it should. In some cases, a tradeoff must be made between the assurance given by regression testing every time a change is made and the resources required to perform the regression tests, which can be quite time consuming due to the large number of tests that may be executed. Regression testing involves selecting, minimizing, and/or prioritizing a subset of the test cases in an existing test suite . Regression testing can be conducted at each of the test levels described in section 2.1, The Target of the Test, and may apply to functional and nonfunctional testing. Performance testing verifies that the software meets the specified performance requirements and assesses performance characteristics—for instance, capacity and response time. Security testing is focused on the verification that the software is protected from external attacks. In particular, security testing verifies the confidentiality, integrity, and availability of the systems and its data. Usually, security testing includes verification against misuse and abuse of the software or system (negative testing). Stress testing exercises software at the maximum design load, as well as beyond it, with the goal of determining the behavioral limits, and to test defense mechanisms in critical systems. Interface defects are common in complex systems. Interface testing aims at verifying whether the components interface correctly to provide the correct exchange of data and control information. Usually the test cases are generated from the interface specification. A specific objective of interface testing is to simulate the use of APIs by end-user applications. This involves the generation of parameters of the API calls, the setting of external environment conditions, and the definition of internal data that affect the API. In cases where software is built to serve different users, configuration testing verifies the software under different specified configurations. The main task of usability and human computer interaction testing is to evaluate how easy it is for end users to learn and to use the software. In general, it may involve testing the software functions that supports user tasks, documentation that aids users, and the ability of the system to recover from user errors (see User Interface Design in the Software Design KA). One of the aims of testing is to detect as many failures as possible. Many techniques have been developed to do this [6, part 4]. These techniques attempt to “break” a program by being as systematic as possible in identifying inputs that will produce representative program behaviors; for instance, by considering subclasses of the input domain, scenarios, states, and data flows. The classification of testing techniques presented here is based on how tests are generated: from the software engineer’s intuition and experience, the specifications, the code structure, the real or imagined faults to be discovered, predicted usage, models, or the nature of the application. One category deals with the combined use of two or more techniques. Sometimes these techniques are classified as white-box (also called glass-box), if the tests are based on information about how the software has been designed or coded, or as black-box if the test cases rely only on the input/output behavior of the software. The following list includes those testing techniques that are commonly used, but some practitioners rely on some of the techniques more than others. Perhaps the most widely practiced technique is ad hoc testing: tests are derived relying on the software engineer’s skill, intuition, and experience with similar programs. Ad hoc testing can be useful for identifying tests cases that not easily generated by more formalized techniques. Exploratory testing is defined as simultaneous learning, test design, and test execution [6, part 1]; that is, the tests are not defined in advance in an established test plan, but are dynamically designed, executed, and modified. The effectiveness of exploratory testing relies on the software engineer’s knowledge, which can be derived from various sources: observed product behavior during testing, familiarity with the application, the platform, the failure process, the type of possible faults and failures, the risk associated with a particular product, and so on. Equivalence partitioning involves partitioning the input domain into a collection of subsets (or equivalent classes) based on a specified criterion or relation. This criterion or relation may be different computational results, a relation based on control flow or data flow, or a distinction made between valid inputs that are accepted and processed by the system and invalid inputs, such as out of range values, that are not accepted and should generate an error message or initiate error processing. A representative set of tests (sometimes only one) is usually taken from each equivalency class. Test cases are derived by combining interesting values for every pair of a set of input variables instead of considering all possible combinations. Pairwise testing belongs to combinatorial testing, which in general also includes higher-level combinations than pairs: these techniques are referred to as t-wise, whereby every possible combination of t input variables is considered. Test cases are chosen on or near the boundaries of the input domain of variables, with the underlying rationale that many faults tend to concentrate near the extreme values of inputs. An extension of this technique is robustness testing, wherein test cases are also chosen outside the input domain of variables to test program robustness in processing unexpected or erroneous inputs. Tests are generated purely at random (not to be confused with statistical testing from the operational profile, as described in Operational Profile in section 3.5). This form of testing falls under the heading of input domain testing since the input domain must be known in order to be able to pick random points within it. Random testing provides a relatively simple approach for test automation; recently, enhanced forms of random testing have been proposed in which the random input sampling is directed by other input selection criteria . Fuzz testing or fuzzing is a special form of random testing aimed at breaking the software; it is most often used for security testing. Control flow-based coverage criteria are aimed at covering all the statements, blocks of statements, or specified combinations of statements in a program. The strongest of the control flowbased criteria is path testing, which aims to execute all entry-to-exit control flow paths in a program’s control flow graph. Since exhaustive path testing is generally not feasible because of loops, other less stringent criteria focus on coverage of paths that limit loop iterations such as statement coverage, branch coverage, and condition/ decision testing. The adequacy of such tests is measured in percentages; for example, when all branches have been executed at least once by the tests, 100% branch coverage has been achieved. In data flow-based testing, the control flow graph is annotated with information about how the program variables are defined, used, and killed (undefined). The strongest criterion, all definition- use paths, requires that, for each variable, every control flow path segment from a definition of that variable to a use of that definition is executed. In order to reduce the number of paths required, weaker strategies such as all-definitions and all-uses are employed. Although not a technique in itself, the control structure of a program can be graphically represented using a flow graph to visualize codebased testing techniques. A flow graph is a directed graph, the nodes and arcs of which correspond to program elements (see Graphs and Trees in the Mathematical Foundations KA). For instance, nodes may represent statements or uninterrupted sequences of statements, and arcs may represent the transfer of control between nodes. With different degrees of formalization, faultbased testing techniques devise test cases specifically aimed at revealing categories of likely or predefined faults. To better focus the test case generation or selection, a fault model can be introduced that classifies the different types of faults. In error guessing, test cases are specifically designed by software engineers who try to anticipate the most plausible faults in a given program. A good source of information is the history of faults discovered in earlier projects, as well as the software engineer’s expertise. A mutant is a slightly modified version of the program under test, differing from it by a small syntactic change. Every test case exercises both the original program and all generated mutants: if a test case is successful in identifying the difference between the program and a mutant, the latter is said to be “killed.” Originally conceived as a technique to evaluate test sets (see section 4.2. Evaluation of the Tests Performed), mutation testing is also a testing criterion in itself: either tests are randomly generated until enough mutants have been killed, or tests are specifically designed to kill surviving mutants. In the latter case, mutation testing can also be categorized as a code-based technique. The underlying assumption of mutation testing, the coupling effect, is that by looking for simple syntactic faults, more complex but real faults will be found. For the technique to be effective, a large number of mutants must be automatically generated and executed in a systematic way . In testing for reliability evaluation (also called operational testing), the test environment reproduces the operational environment of the software, or the operational profile, as closely as possible. The goal is to infer from the observed test results the future reliability of the software when in actual use. To do this, inputs are assigned probabilities, or profiles, according to their frequency of occurrence in actual operation. Operational profiles can be used during system testing to guide derivation of test cases that will assess the achievement of reliability objectives and exercise relative usage and criticality of different functions similar to what will be encountered in the operational environment . Usability principles can provide guidelines for discovering problems in the design of the user interface [10*, c1s4] (see User Interface Design in the Software Design KA). Specialized heuristics, also called usability inspection methods, are applied for the systematic observation of system usage under controlled conditions in order to determine how well people can use the system and its interfaces. Usability heuristics include cognitive walkthroughs, claims analysis, field observations, thinking aloud, and even indirect approaches such as user questionnaires and interviews. A model in this context is an abstract (formal) representation of the software under test or of its software requirements (see Modeling in the Software Engineering Models and Methods KA). Model-based testing is used to validate requirements, check their consistency, and generate test cases focused on the behavioral aspects of the software. The key components of model-based testing are : the notation used to represent the model of the software or its requirements; workflow models or similar models; the test strategy or algorithm used for test case generation; the supporting infrastructure for the test execution; and the evaluation of test results compared to expected results. Due to the complexity of the techniques, model-based testing approaches are often used in conjunction with test automation harnesses. Model-based testing techniques include the following. Decision tables represent logical relationships between conditions (roughly, inputs) and actions (roughly, outputs). Test cases are systematically derived by considering every possible combination of conditions and their corresponding resultant actions. A related technique is cause-effect graphing [1*, c13s6]. By modeling a program as a finite state machine, tests can be selected in order to cover the states and transitions. Stating the specifications in a formal language (see Formal Methods in the Software Engineering Models and Methods KA) permits automatic derivation of functional test cases, and, at the same time, provides an oracle for checking test results. TTCN3 (Testing and Test Control Notation version 3) is a language developed for writing test cases. The notation was conceived for the specific needs of testing telecommunication systems, so it is particularly suitable for testing complex communication protocols. Workflow models specify a sequence of activities performed by humans and/or software applications, usually represented through graphical notations. Each sequence of actions constitutes one workflow (also called a scenario). Both typical and alternate workflows should be tested [6, part 4]. A special focus on the roles in a workflow specification is targeted in business process testing. Model-based and code-based test techniques are often contrasted as functional vs. structural testing. These two approaches to test selection are not to be seen as alternatives but rather as complements; in fact, they use different sources of information and have been shown to highlight different kinds of problems. They could be used in combination, depending on budgetary considerations. Measures based on software size (for example, source lines of code or functional size; see Measuring Requirements in the Software Requirements KA) or on program structure can be used to guide testing. Structural measures also include measurements that determine the frequency with which modules call one another. The testing literature is rich in classifications and taxonomies of faults. To make testing more effective, it is important to know which types of faults may be found in the software under test and the relative frequency with which these faults have occurred in the past. This information can be useful in making quality predictions as well as in process improvement (see Defect Characterization in the Software Quality KA). A program under test can be evaluated by counting discovered faults as the ratio between the number of faults found and the size of the program. A statistical estimate of software reliability, which can be obtained by observing reliability achieved, can be used to evaluate a software product and decide whether or not testing can be stopped (see section 2.2, Reliability Achievement and Evaluation). 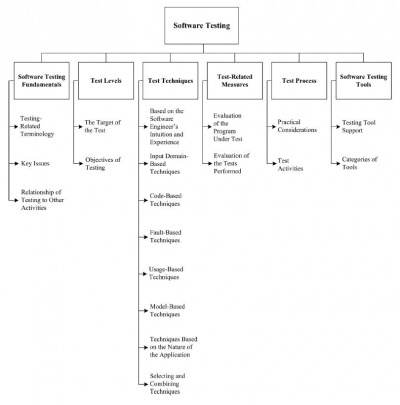 Several test adequacy criteria require that the test cases systematically exercise a set of elements identified in the program or in the specifications (see topic 3, Test Techniques). To evaluate the thoroughness of the executed tests, software engineers can monitor the elements covered so that they can dynamically measure the ratio between covered elements and the total number. For example, it is possible to measure the percentage of branches covered in the program flow graph or the percentage of functional requirements exercised among those listed in the specifications document. Code-based adequacy criteria require appropriate instrumentation of the program under test. In fault seeding, some faults are artificially introduced into a program before testing. When the tests are executed, some of these seeded faults will be revealed as well as, possibly, some faults that were already there. In theory, depending on which and how many of the artificial faults are discovered, testing effectiveness can be evaluated and the remaining number of genuine faults can be estimated. In practice, statisticians question the distribution and representativeness of seeded faults relative to genuine faults and the small sample size on which any extrapolations are based. Some also argue that this technique should be used with great care since inserting faults into software involves the obvious risk of leaving them there. In mutation testing (see Mutation Testing in section 3.4, Fault-Based Techniques), the ratio of killed mutants to the total number of generated mutants can be a measure of the effectiveness of the executed test set. Several studies have been conducted to compare the relative effectiveness of different testing techniques. It is important to be precise as to the property against which the techniques are being assessed; what, for instance, is the exact meaning given to the term “effectiveness”? Possible interpretations include the number of tests needed to find the first failure, the ratio of the number of faults found through testing to all the faults found during and after testing, and how much reliability was improved. Analytical and empirical comparisons between different techniques have been conducted according to each of the notions of effectiveness specified above. Testing concepts, strategies, techniques, and measures need to be integrated into a defined and controlled process. The test process supports testing activities and provides guidance to testers and testing teams, from test planning to test output evaluation, in such a way as to provide assurance that the test objectives will be met in a cost-effective way. An important element of successful testing is a collaborative attitude towards testing and quality assurance activities. Managers have a key role in fostering a generally favorable reception towards failure discovery and correction during software development and maintenance; for instance, by overcoming the mindset of individual code ownership among programmers and by promoting a collaborative environment with team responsibility for anomalies in the code. The testing phases can be guided by various aims—for example, risk-based testing uses the product risks to prioritize and focus the test strategy, and scenario-based testing defines test cases based on specified software scenarios. Test activities conducted at different levels (see topic 2, Test Levels) must be organized—together with people, tools, policies, and measures—into a well-defined process that is an integral part of the life cycle. Documentation is an integral part of the formalization of the test process [6, part 3]. Test documents may include, among others, the test plan, test design specification, test procedure specification, test case specification, test log, and test incident report. The software under test is documented as the test item. Test documentation should be produced and continually updated to the same level of quality as other types of documentation in software engineering. Test documentation should also be under the control of software configuration management (see the Software Configuration Management KA). Moreover, test documentation includes work products that can provide material for user manuals and user training. Test-driven development (TDD) originated as one of the core XP (extreme programming) practices and consists of writing unit tests prior to writing the code to be tested (see Agile Methods in the Software Engineering Models and Method KA). In this way, TDD develops the test cases as a surrogate for a software requirements specification document rather than as an independent check that the software has correctly implemented the requirements. Rather than a testing strategy, TDD is a practice that requires software developers to define and maintain unit tests; it thus can also have a positive impact on elaborating user needs and software requirements specifications. Formalizing the testing process may also involve formalizing the organization of the testing team. The testing team can be composed of internal members (that is, on the project team, involved or not in software construction), of external members (in the hope of bringing an unbiased, independent perspective), or of both internal and external members. Considerations of cost, schedule, maturity levels of the involved organizations, and criticality of the application can guide the decision. Several measures related to the resources spent on testing, as well as to the relative fault-finding effectiveness of the various test phases, are used by managers to control and improve the testing process. These test measures may cover such aspects as number of test cases specified, number of test cases executed, number of test cases passed, and number of test cases failed, among others. Evaluation of test phase reports can be combined with root-cause analysis to evaluate testprocess effectiveness in finding faults as early as possible. Such an evaluation can be associated with the analysis of risks. Moreover, the resources that are worth spending on testing should be commensurate with the use/criticality of the application: different techniques have different costs and yield different levels of confidence in product reliability. A decision must be made as to how much testing is enough and when a test stage can be terminated. Thoroughness measures, such as achieved code coverage or functional coverage, as well as estimates of fault density or of operational reliability, provide useful support but are not sufficient in themselves. The decision also involves considerations about the costs and risks incurred by possible remaining failures, as opposed to the costs incurred by continuing to test (see Test Selection Criteria / Test Adequacy Criteria in section 1.2, Key Issues). To carry out testing or maintenance in an organized and cost-effective way, the means used to test each part of the software should be reused systematically. A repository of test materials should be under the control of software configuration management so that changes to software requirements or design can be reflected in changes to the tests conducted. The test solutions adopted for testing some application types under certain circumstances, with the motivations behind the decisions taken, form a test pattern that can itself be documented for later reuse in similar projects. As shown in the following description, successful management of test activities strongly depends on the software configuration management process (see the Software Configuration Management KA). Like all other aspects of project management, testing activities must be planned. Key aspects of test planning include coordination of personnel, availability of test facilities and equipment, creation and maintenance of all test-related documentation, and planning for possible undesirable outcomes. If more than one baseline of the software is being maintained, then a major planning consideration is the time and effort needed to ensure that the test environment is set to the proper configuration. Generation of test cases is based on the level of testing to be performed and the particular testing techniques. Test cases should be under the control of software configuration management and include the expected results for each test. The environment used for testing should be compatible with the other adopted software engineering tools. It should facilitate development and control of test cases, as well as logging and recovery of expected results, scripts, and other testing materials. Execution of tests should embody a basic principle of scientific experimentation: everything done during testing should be performed and documented clearly enough that another person could replicate the results. Hence, testing should be performed in accordance with documented procedures using a clearly defined version of the software under test. The results of testing should be evaluated to determine whether or not the testing has been successful. In most cases, “successful” means that the software performed as expected and did not have any major unexpected outcomes. Not all unexpected outcomes are necessarily faults but are sometime determined to be simply noise. Before a fault can be removed, an analysis and debugging effort is needed to isolate, identify, and describe it. When test results are particularly important, a formal review board may be convened to evaluate them. Testing activities can be entered into a testing log to identify when a test was conducted, who performed the test, what software configuration was used, and other relevant identification information. Unexpected or incorrect test results can be recorded in a problem reporting system, the data for which forms the basis for later debugging and fixing the problems that were observed as failures during testing. Also, anomalies not classified as faults could be documented in case they later turn out to be more serious than first thought. Test reports are also inputs to the change management request process (see Software Configuration Control in the Software Configuration Management KA). Defects can be tracked and analyzed to determine when they were introduced into the software, why they were created (for example, poorly defined requirements, incorrect variable declaration, memory leak, programming syntax error), and when they could have been first observed in the software. Defect tracking information is used to determine what aspects of software testing and other processes need improvement and how effective previous approaches have been. Testing requires many labor-intensive tasks, running numerous program executions, and handling a great amount of information. Appropriate tools can alleviate the burden of clerical, tedious operations and make them less error-prone. Sophisticated tools can support test design and test case generation, making it more effective. Guidance to managers and testers on how to select testing tools that will be most useful to their organization and processes is a very important topic, as tool selection greatly affects testing efficiency and effectiveness. Tool selection depends on diverse evidence, such as development choices, evaluation objectives, execution facilities, and so on. In general, there may not be a unique tool that will satisfy particular needs, so a suite of tools could be an appropriate choice. Test harnesses (drivers, stubs) [1*, c3s9] provide a controlled environment in which tests can be launched and the test outputs can be logged. In order to execute parts of a program, drivers and stubs are provided to simulate calling and called modules, respectively. Test generators [1*, c12s11] provide assistance in the generation test cases. The generation can be random, path-based, model-based, or a mix thereof. Capture/replay tools [1*, c12s11] automatically reexecute, or replay, previously executed tests which have recorded inputs and outputs (e.g., screens). Oracle/file comparators/assertion checking tools [1*, c9s7] assist in deciding whether a test outcome is successful or not. Coverage analyzers and instrumenters [1*, c4] work together. Coverage analyzers assess which and how many entities of the program flow graph have been exercised amongst all those required by the selected test coverage criterion. The analysis can be done thanks to program instrumenters that insert recording probes into the code. Tracers [1*, c1s7] record the history of a program’s execution paths. Regression testing tools [1*, c12s16] support the reexecution of a test suite after a section of software has been modified. They can also help to select a test subset according to the change made. Reliability evaluation tools [9*, c8] support test results analysis and graphical visualization in order to assess reliability-related measures according to selected models. M.R. Lyu, ed., Handbook of Software Reliability Engineering, McGraw-Hill and IEEE Computer Society Press, 1996. H. Zhu, P.A.V. Hall, and J.H.R. May, "Software Unit Test Coverage and Adequacy", ACM Computing Surveys, vol. 29, no. 4, Dec. 1997, pp. 366-427. E.W. Dijkstra, "Notes on Structured Programming", T.H.-Report, 70-WSE-03, Technological University, Eindhoven, 1970, http://www.cs.utexas.edu/users/EWD/ewd02xx/EWD249.PDF. ISO/IEC/IEEE P29119-1/DIS Draft Standard for Software and Systems Engineering— Software Testing—Part 1: Concepts and Definitions, ISO/IEC/IEEE, 2012. S. Yoo and M. Harman, "Regression Testing Minimization, Selection and Prioritization: A Survey", Software Testing Verification and Reliability, vol. 22, no. 2, Mar. 2012, pp. 67-120. J. Nielsen, Usability Engineering, Morgan Kaufmann, 1993. T.Y. Chen et al, "Adaptive Random Testing: The ART of Test Case Diversity", Journal of Systems and Software, vol. 83, no. 1, Jan. 2010, pp. 60-66. Y. Jia and M. Harman, "An Analysis and Survey of the Development of Mutation Testing", IEEE Trans. Software Engineering, vol. 37, no. 5, Sep-Oct. 2011, pp. 649-678. M. Utting and B. Legeard, Practical Model-Based Testing: A Tools Approach, Morgan Kaufmann, 2007. This page was last modified on 24 August 2015, at 19:23.